Kind of enjoying the boys (4 and 7) being around, tho they wear me out first thing in the morning and just before bedtime with their rambunctiousness. Had a nice stretch of weather yesterday afternoon, so dug out all the Tonka toys and moved dirt in the driveway for a couple of hours, interspersed with rides up and down on their bikes. 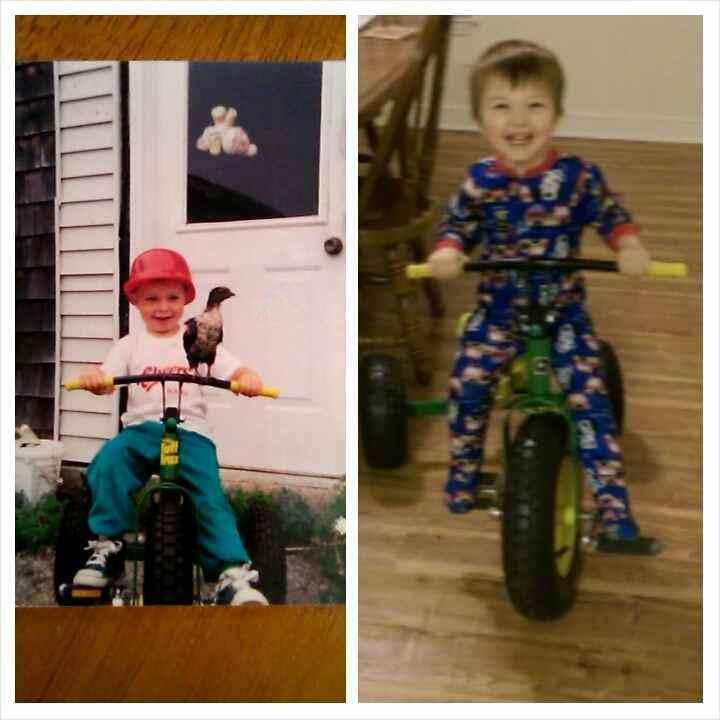 Jayden (the older one) on his two wheeler, Travis on the John Deere Big Wheel I bought for his Dad when HE was about 4. That's Dad (my grandson Casey, with his pet turkey) on the left and my great-grandson Jayden on the right. I got to thinking about being a pre-teen and riding my bike up and down the country roads with my playing card "motor" flapping in the spokes and decided Jayden needed to know about that. Took a little doing to get it rigged right, but Jayden thought it was pretty neat when I got it "tuned". Kids is kids: pretty much anything that makes noise is a Good Thing. I'd check that the rotor is seated properly and the cap is clipped down snug for starters. If it has a ballast resistor, check the connections to it. Also check that the connections at the coil both from the battery and to the distributor are clean and tight. If all that is good, try a fresh coil. Even if it's a new coil, there's a high incidence of coils being bad right out of the box. Likewise the condenser in the distributor. Not all new condensers are good condensers, especially since everything is sourced out of China these days. A guy on ytmag says maybe shorting out some of the time where the coil wire goes thru the dist. When it runs it runs good. I think I can check that when it stops raining.